Any of my readers out there watch Once Upon a Time? I enjoy the show, though I've fallen behind in the past season. We used to watch it every week on Hulu right as it came out, but now only my wife tries to do that. I've fallen into the binge watching mode on OUAT. I do like the twists they put on characters and back stories. I've actually gotten to meet a couple of the actors on the show, but that's not what this week's #MagicalMickey post is about. If you know the show, you know the name Mr. Gold. He's actually been one of my favorite characters from early on. Frankly, it takes a great actor and great writing to make a villain you hate. The more you hate him, the better the job they did. But he's also a complex character, that even when he was bad, I still liked him, but I digress. If you know the show, you'll recognize this sign. 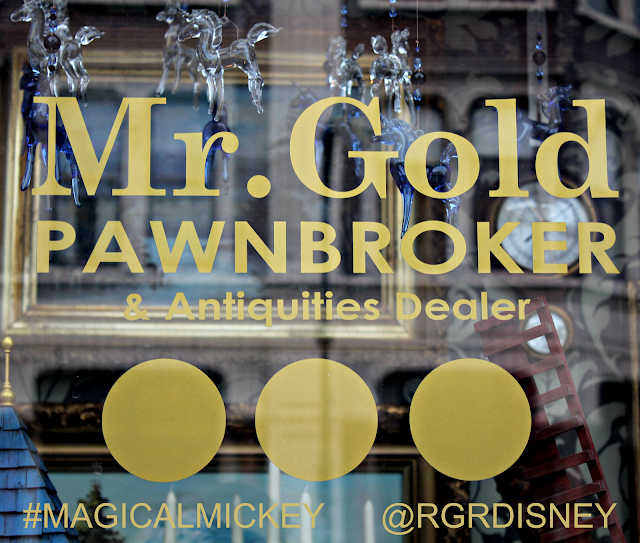 That is the sign for Mr. Gold's shop, but it's not from the movie set (though my guess is the Christmas lights gave it away). That is the storefront set up in Disney's Hollywood Studios, back in the Streets of America near Lights, Motors, Action! Extreme Stunt Show. Imagineers has transformed one of the windows from a New York City storefront into one out of Storybrook. In the window, you'll find a plethora of items from the show, from the book, to the dagger, to a pair of glass slippers. It's very cool if you're a fan of the show to see what you can find. I'll leave some pictures for you to see what you can see, though these only scratch the surface and hit some of the big items. This is one of the things I love about Disney-MGM Studios growing up, all the things you'd see from TV and movies. You can still see some, such as in the Great Movie Ride, but not as much as you used to. Now, our pictures were taken as the Osborne Family Spectacle of Dancing Lights was being set up, sadly for the last time. Of course, now that it has finished, attractions in this are may start to close in the near future to make way for Star Wars Land. If are a huge fan and want to see this, I'd make it sooner rather than later. Do you watch Once Upon a Time? Would you like Hollywood Studios to have more things like this?